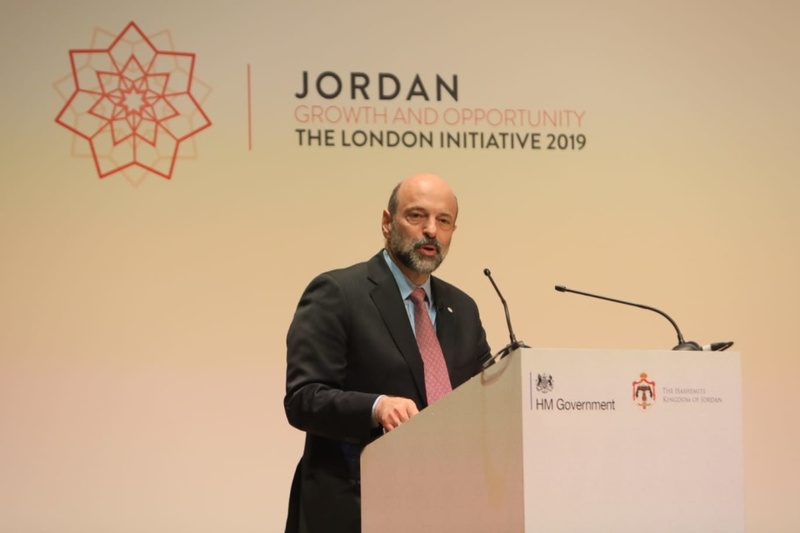 Speech as delivered to the Jordan: Growth and Opportunity Conference in London, 28 February 2019. On behalf of the Government of Jordan, and the people we serve, allow me to thank Prime Minister Theresa May and her outstanding team for their efforts to give Jordan this timely platform, which builds on a long and ever-fruitful partnership between Jordan and the United Kingdom. My appreciation goes to my fellow Jordanian participants, especially the young women and men who came with us, through the Crown Prince Foundation, in order to represent the views of the youth in their localities. And also, to the friends of Jordan. Let’s remember that we have stood together in many fora, over many decades, in the service of peace, prosperity and global stability. I sincerely thank you for being here today, as a testament of your commitment to the Hashemite Kingdom of Jordan and the values we share. Allow me to start by telling you about a recent archaeological discovery in northeastern Jordan, where the world’s oldest piece of bread was found in a stone fireplace, dating back to a 14,500 year-old settlement, 4,000 years before the agricultural era began to take hold. These oldest known remnants of bread left by our ancestors represent the kind of innovation and determination that we have preserved to this day, and, as Jordanians, we have shared and continue to share our bread with others. These traits have become embedded in Jordan’s DNA. In today’s proceedings we hope to share our unique and compelling, even exciting, story with you. For, although we have faced a difficult period, we are at one of the most promising, pivotal points of our history as well. As you all know, Jordan lives in a tough neighborhood….. And while our neighborhood is a matter of ‘destiny’, what Jordan has chosen to do with its geopolitical circumstances has been a matter of sheer will and determination. In this complex and turbulent region, we have chosen to stick by the simple ethos of ‘do well by doing good’, for ourselves and for others. If you recall, when the 2016 ‘Supporting Syria and the Region’ conference was held in London the focus was on the international impact of the unfolding Syrian refugee crisis. For Jordan, that meant 1.3 million Syrians entering Jordan within less than five years. The impact on our infrastructure and economy was tremendous. According to World Bank estimates, our open door policy towards Syrians cost Jordan $2.5 billion per year. At the time, His Majesty King Abdullah warned that Jordan had reached a “boiling point”. Gratefully, some aid and support did come from the international community, and in our characteristically resolute, inventive and constructive way, Jordan managed to stabilise the situation and carry on doing good, serving our citizens and including all refugees in our health and education services. This brings us back to why we are here and what we hope to achieve today. It is now the time for all of us to move forward from crisis management to growth and prosperity realization by working together with old friends and new partners to do good and do well. Our dear friends, our partners. First and foremost, Jordan’s immediate focus is to stimulate economic growth in order to provide greater opportunities to our citizens, now and for the future. Moving forward on this mandate has required a number of tough and swift actions related to macroeconomic stability, stimulating economic growth, bringing down the cost of energy and unleashing the tremendous human capital potential in Jordan. Since coming to office eight months ago, my government has worked with Parliament to introduce a fairly stringent set of measures, including the elimination of certain subsidies, a reduction in public expenditures and the introduction of a new income tax law that fortifies the country’s fiscal foundations. In parallel, the government launched its priority action plan focused on improving people’s lives, which are centered on three main pillars: to strengthen the rule of law and governance; to provide better public services; and to propel economic growth, productivity and job creation. Within this guiding framework, between January 2018 and February 2019, we have undertaken scores of key reforms, some of which will be presented today, from making sure procurement processes are more efficient and transparent; to strengthening Jordan public officials’ financial disclosure requirements; to introducing bold new labour laws designed to encourage women’s participation in the workforce. Jordan understands that its path to sustainable and equitable economic growth includes aggressively increasing exports and foreign direct investments and enhancing its operational competitiveness. For this, we have developed a Five-Year Reform and Growth Matrix, which combines short- and medium-term actions for a realistic economic transformation with key measures and outcomes. This Matrix is devised to create not just jobs, but also an enabling economic environment for the advancement of Jordan’s educated, skilled and motivated population, especially women and youth, in already leading fields in Jordan, such as business services, technology, healthcare, engineering, tourism and logistics, to name a few. I can say with confidence that Jordan is now well positioned for investment and growth. Whether this is in business-process outsourcing, reconstruction effort in neighbouring countries or export of goods using our exceptional trade agreements with the US, Europe as well as countries in the region and beyond. A valuable tool for investors that we have developed in cooperation with our international partners is the ‘Project Pipeline Development Facility’. The Project Pipeline is geared towards preparing Public-Private Partnership projects that would attract investments in key sectors such as water, health, ICT, tourism, waste management and transport. You will hear much more about all of these sectors today, but allow me now to highlight our proven track record in Jordan’s very promising, and just barely tapped, energy sector. Frequent energy supply disruptions from regional sources taught us the importance of energy diversification and self-reliance. Remarkably, it is in the same decade that we faced the greatest difficulties that we have also made great strides in the right direction. By utilising our abundant supply of renewable energy … Jordan is well positioned to take advantage of a future full of emerging opportunities. Now, we see energy as part of the solution, instead of a problem. Indeed, targeted investments in Jordan’s energy sector is setting in motion a virtuous cycle in the national economy, bringing down production costs, greening the economy, and allowing businesses big and small to become more competitive. Energy is just one sector that we, together with our international partners, plan to target in order to unlock Jordan’s full potential. Many other sectors have the same dynamic potential, and you will be hearing a lot more about them in upcoming sessions. Importantly, we want to hear from you because we hope these sessions today are just the beginning of a long-term dialogue and partnership between us. My friends, the past decade, as difficult as it was, did teach us a few things about resilience, perseverance and growth. Historically, Jordan has withstood one regional trauma after the other, and, despite this, Jordan has done and will continue to do all it can to do well by doing good, for ourselves, our region and our partners across the globe. We will continue to make bread and share it as we did 14,000 years ago, but also privately provided public goods, business services, innovations, and green solutions. That’s our ethos - it’s in our national DNA - and we want all of you to be with us in this exiting journey to make this a better world.